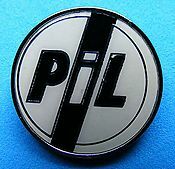 Do you remember that 80’s P.I.L. song “This is not a love song”? You loved it? Good, because I’m trying to do my best to convince you that this post “is not an heresy”! Wish me luck. Like five thousand years ago, when He created heaven out of pure chaos in 7 days, the same can be said of the Vans crew that, over the past 7 years tried to embody his prowess and reproduce the Clash of the cultures and plant Anarchy in the OC. The Van Doren family is very good –indeed- but they need more time than Him. Pool Party. Street League "T.M." is not pool riding. Pic by Dime Squad - Street League 'T.M'". The X-Games was invented to revitalize dying television ratings, not to support extreme sports. Can the same can be said of the future participation of skateboarding at the Olympics …. Can the same be said of a couple of Skateboarding Magazines dedicating bare coverage of the event? Their crews are present and enjoying the party. There was even once a media contest within the contest with skaters like Garret Shigenaka, Brian Fick, Scott Taylor, Jim Murphy, Buddy Carr, Scott Taylor, Dave Swift and Roger Harrel. And it's not that they are not capable of covering the event, but they probably just don’t care about pool riding. You see, they have to sell Mags and so far pool contests are not really mainstream skateboarding. Can the same be said about "youth against establishment" brands sold to Gucci for $608 million? A burger with your Combi? 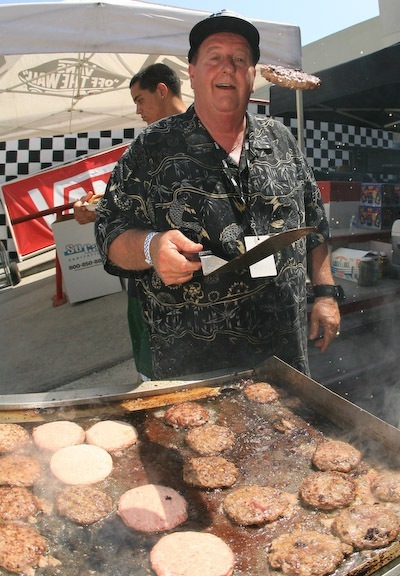 Chef Steve Van Doren at work. It has been written that the Protec Pool Party is “the epicenter of the most intense explosion of skateboarding contest energy ever released in history”. 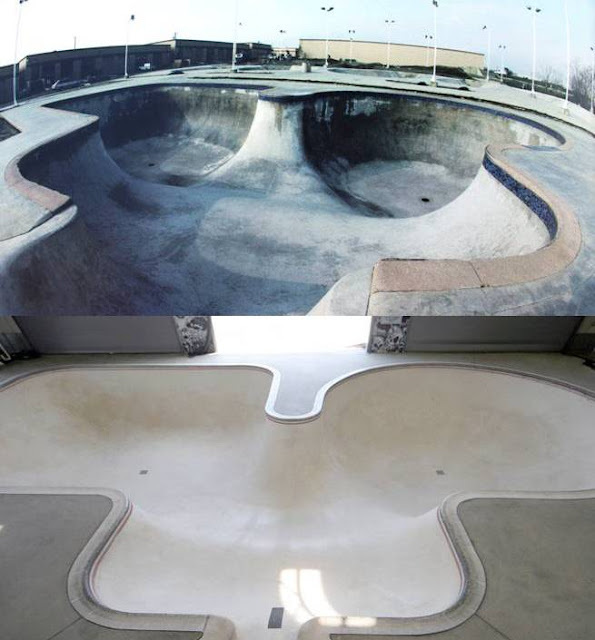 To give you an idea, take a regular skate park that usually sees 20 pool skaters a day and retrofit it to accommodate bleachers and 1500 fans on testosterone overload. Add dangerousness and insanity, a superb lighting system (thanks to Fuel.TV), woofer and speakers from hell usually powered by Double D, the who’s who of worldwide skateboarding, free food and hamburgers catered by Chef Van Doren, energy drinks ad libitum, a challenging bowl, an insane jam format, the toughest of the tough on the roster, and the result is pure inferno. By now, everybody knows that the Combi is not a replica of the original Combi located at Pipeline since 1977 and destroyed in September 88. When the Hoffmans opened Pipeline in 1977, the pool was missing. They came short with $30,000 and asked the pros to give anywhere from $1,000 to $2,000. They also asked the local and infamous brothers Alba to help with the design. The Combi soon became the Mecca of the who’s who in skateboarding. The general layout of the Combi Pool at Vans is similar to the original, but the two are also different in a sense that the new one is not so gnarly. Vans extended the hip too far between sides and the lines are different. Well, of course only Malba, Salba, Chris Miller, Hosoi and a bunch of others Masters can notice the difference: they say the new one is easier than the old one. Yeah right! The reality is that when you put side by side the pics of the two Combi Pools, they Basically look the same. How did the Pros preformed in 2005? First, Bucky Lasek pulled a handless frontside bluntslide around the square corner. Burnquist followed suit by starting his runs doing switch roll-ins to switch corner airs, and indy kickflips to fakies. Rune Glifberg was on fire, taking on multiple riders at once and having a good time doing it. Omar Hassan was in every nook and cranny of the Combi pulling tricks no one else will ever have the balls to try. Frankly , to see Jimmy The Greek and Trujillo going into that pool without pads is pure insanity they shredded up the bowl with no real plan of attack just a straight out mad dog rush at whatever wall came up next. Rune and Brian Patch doing full doubles runs un-planned nearly made the crowd erupt in joy. Benji Galloway repertoire seems limitless, he was a crafty fucker pulling all kinds of tricks from his bottomless sack. Jake Piaseki and Bruno Passos were in there battling it out too with big airs and inverts. The first Pro-Tec Pool Party really felt like a great moment in skate history and for those who had the opportunity to witness it it’s gonna be endless memories. At the end of the day, Rune Glifberg took home - $25,000, Omar Hassan $15,000 and Brian Patch $8,000. At the Protec Pool Party 2006, admission was still free, but only a very small number of tickets were available at select Southern California PRO-TEC Retailers which were holding a raffle for the tickets. 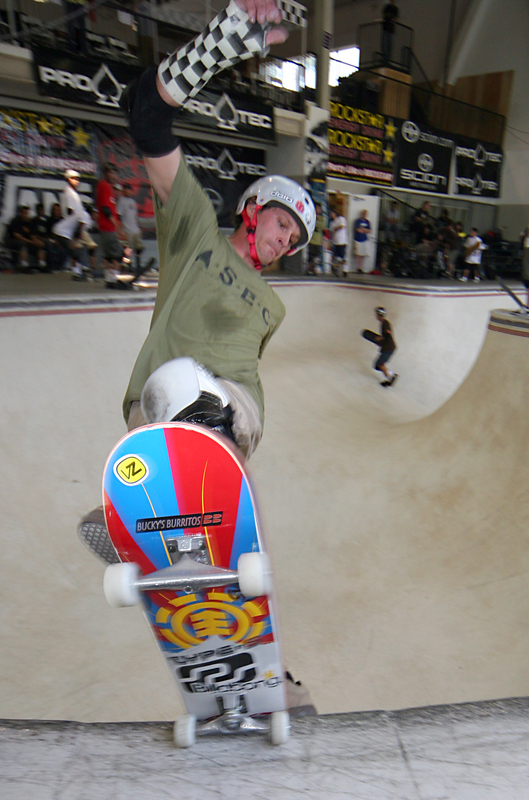 2006 also marks a presentation made by Bucky Lasek for the Make-A-Wish foundation and Vans. Omar Hassan won the title with Rune Glifberg ripping hard and landed in second place! Bucky Lasek in 2009. Photo Unknown. Kickflip backlip first flippin' try, backside tails around the corners, sick standup backside nosegrinds, frontside heelflip first try, right out of the gate...Rune was on fire... Also can't forget to mention Brian Patch who arrived 3rd. The question some had during the Vans Protec Pool Party 2007 was whether or not some Masters could continue to push them and compete in events like this? The 2007 pro’s finals was very heated with some much debated results, but skateboard contests are going to be controversial, they always have been, they always will be. There were 3 pro preliminary heats that were extremely difficult to judge because skateboarding competition has evolved into a jam format for better or for worse depending on how you personally choose to look at it. Of course skaters like Bucky Lasek, Lincoln Ueda and Sergie Ventura, will not flow on the exact same type of lines that Omar Hassan will, getting something out of every square inch of the pool. Let’s not talk about an inferior approach, but let’s talk about the way they skate, competing on opposing wooden walls and that's pretty much where their skating talent developed. Vert riders against pool riders, technicality against flow. In the early 80’s pool skaters would not recognize the talent of someone like Tony Hawk , a natural born-vert rider. He was too technique and not enough flowing… See where he got 20 years later? The fact that I mention his name is not fortuit. A guy like Bucky led the charge of the vert dogs, utilized the bowl's multiple traits like never before, and skated it much like it was intended to be skated. That day, Bucky was not just a skate-lite back-and-forther. In the end the final saw some of the best vert dogs in the world. Rune Glifberg and Bucky Lasek were the two skaters that really stood out and captured the top 2 spots. Discussion over. 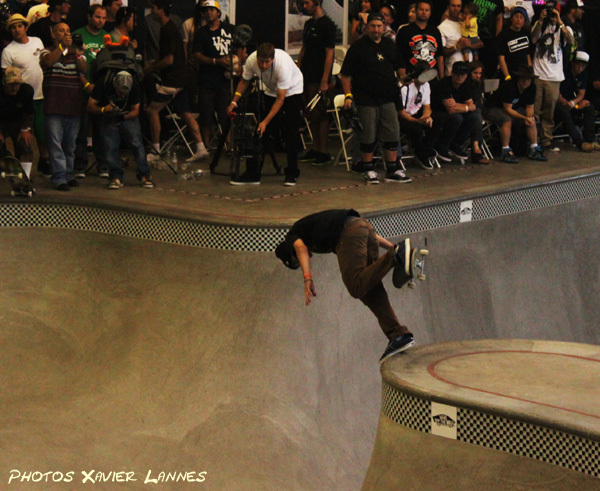 The fourth year up and running of the Vans Pro-Tec Pool Party at the Combi-Bowl in Orange County was insane, as usual. Omar Hassan in 2006. Photo Unknown. Steve Caballero won the THRASHER/VANS boardslide contest on with a total of eighteen blocks slide around the round pool of the Van’s combi. Ho got $1800 for that perf. Rune Glifberg 33, from Copenhagen was 1st and pocketed $25,000, Omar Hassan 34 from Costa Mesa was second with $15,000. Bucky Lasek 35, From Baltimore got $7,500 and Bob Burnquist 31, From Rio de Janeiro $3,000. There was a minor incident when an 11 year old girl collided with another chick in the bowl and was basically knocked out, to which Dave Duncan commented over the microphone, "That's what happens when you skate with the big girls." As usual, the 2009 installment of the Protec Pool Party was an organized chaos at best mixed with heavy duty skateboarding: Josh Borden, Matt Boyster, Josh Rodriguez, Michael Brookman and Pedro Barros made skateboarding beyond fascinating even if they all have different styles and different approaches they are all pushing the limits of sanity. The now classic fight between Bucky Lask, Rune Glifberg and Omar Hassan was a given. Even with an injury, Rune Glifberg is so consistent that you can’t just assume he will be out on the first heat and “Don” Omar has so much in his bag of tricks that it was like watching a PBS report about the memoir of vertical skateboarding. On the other hand, Bucky has also a bag full of tricks, but his are some that nobody else is trying to do. When it came down to the finals, Bucky's opening salvoes blew everyone out. It took him five years, but Bucky Lasek finally got his Pro-tec Pool Party title, slowly jumping from 6th to 1st place. He claimed his first title and the $25,000 bounty that goes with it along with former winners Omar Hassan (2006) and Rune Glifberg (2005, 2007, 2008) placing second and third in a Pro Division final that featured charges by youngsters including 14-year old Brazillian Pedro Barros, 20 year-old Josh Borden and 17 year-old Josh Rodriguez. Saturday May 22nd 2010 was the Vans and Pro-Tec Pool Party, the 6th in a row. The newly renovated Combi Bowl just refurbished with brand new polished concrete, was the talk of the day: is it better now? Is it more slippery now? Eventually everybody agreed that the bowl was now better than ever, even the Judges which included Tony Alva, John Cardiel and Bryce Kanights. of the best lines in there, like the triple hip air line (air on the round shallow hip, then air the middle hip and then air the shallow square hip). Lincoln Ueda definitely goes the highest in that bowl: he's all over the fence and his body jars are the biggest the Combi Pool has ever seen... that boy's got some power. At the end, Bucky Lasek praised the newly-updated pool as “really rideable” and promised to be back next year (as did Glifberg, who said he wasn’t sure until just a few days ago that he’d even be here), he also took home $30K and another Pro-Tec Pool Party title. Lasek edged three-time winner Rune Glifberg for the win while ’06 winner Omar Hassan took third. One of them being that I don’t know. Nobody knows the place and the time… The other reason being that last time I did a prediction, it failed: yes, I predicted last year that Grosso would win the Blocks For Bucks contest (28 blocks slide); but I also I predicted that either Andy McDonald or Pedro Barros would win the Oi Vert Jam in Rio a couple of Month ago. I should have shut my mouth. … Andy Mac did not make the podium (he landed 4th) and Pedro Barros was not even qualified for the final (Marcelos Bastos won that day). What a bummer! 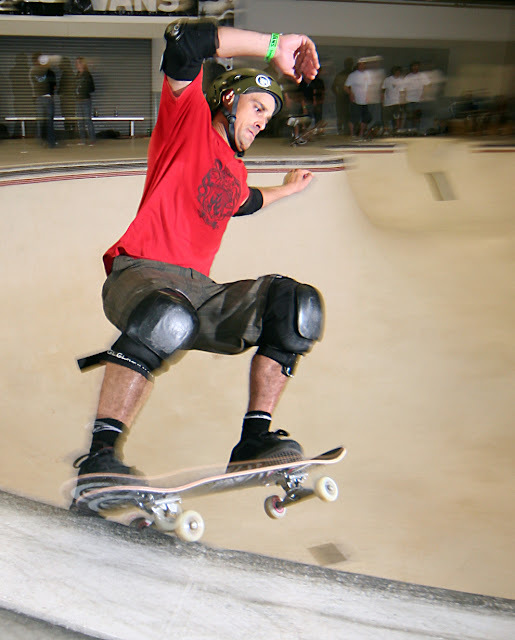 In retrospective, Pedro Barros would not have win the Oi Vert Jam because he really excels in Bowl-Pool riding (not in ramp riding): he won both Bowl-A-Rama last February down under (In Wellington and Sydney). But isn’t it what it’s all about here: bowl and pool riding excellence? Now, take a look at the chart on the left. You easily see Bucky Lasek, Rune Glifberg and Omar Hassan tangled in the podium for the past 5 years. Those 3 have consistently made the top spots of any major bowl contest in the past 10 years and we expect them to do so in the future… Right? Then, in 2009 out of nowhere came Pedro Barros to 4th place, a feat that he repeated again in 2010. The same can be said of Nolan Monroe who already landed 4 times in the top 10 and at 5th spot last year. By looking at the chart, you can predict that any of those 5 guys (Bucky Lasek, Rune Glifberg, Omar Hassan and Pedro Barros) can win the Pro-Tec this year. It’s gonna be an epic battle, I’m telling you, because on top of those 5 guys are coming Nolan Monroe, Josh Rodriguez Alex Perelson and Josh Borden. The real uncertainty here is that since some of the winners of the Ams Protec Pool Party at Vans skatepark (that took place last February 2011) will also be let loose in the pit this year anything can happen. Thanks to Juice, Vans and Concrete Disciples who seems the only ones to really care about the event, you guys rock. Keep up with the good job. Meanwhile, see you at a pit near you and remember that this is not “I Skate, Therefore I Am”. Too bad pool riding isn't as popular as it once was but thanks to you for letting everyone know about this rad event! Hope that wrist of yours is better! !